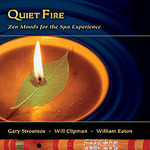 Quiet Fire CD by Gary Stroutsos, Will Clipman and William Eaton is New Age spa music for relaxation, massage and meditation. Quiet Fire marks the first meeting of three remarkable artists, each distinguished for shaping (and reshaping) the face of contemporary world music. The woodwinds of master flautist Gary Stroutsos; William Eaton’s handcrafted stringed instruments; pan-global percussion by Will Clipman—disparate elements fused together in a meditative celebration of newfound common ground. More than an exchange between musical minds, however, Quiet Fire represents a new nexus of sound. Koto-harp guitar, Chinese bamboo Xiao flute, water drums, udu and other exotic instruments don’t just mingle; they merge. The result: earfuls of open sky and whispering willows, a natural sound to unwind the mind and pacify the soul. 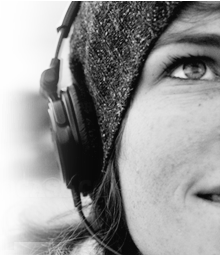 Attuned to the soothing hum of well-being, Quiet Fire is a musical journey impelled by an innate sensitivity. To luxuriate in its depth is to gaze into the reflecting pool of the heart. The view will ignite your imagination and restore your spirit. Since its release, Quiet Fire has been a top-selling New Age album in the iTunes Music Store.